I live for the fall. It is hands-down my absolute favorite time of year. I'm already brewing pumpkin spice coffee and roasting up root vegetables. To be honest, I grew up in the Hudson Valley, so I think this is far and away the best place to enjoy all that fall has to offer. 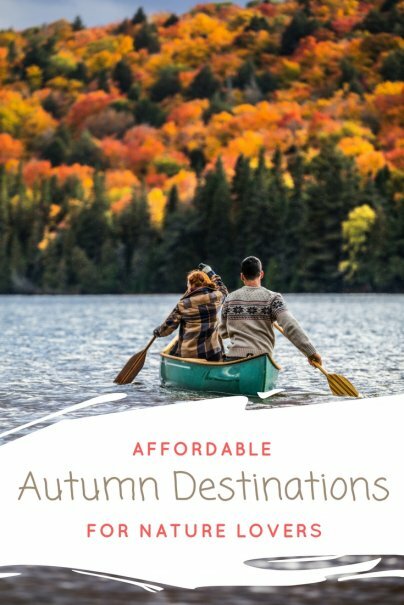 You can pick pumpkins and apples, dine al fresco in the harvest fields, go for a hike in the gorgeous Catskill Mountains, or hop on a hayride. There is a place and an activity for everyone, at a price that's too good to pass up. And it's only a quick two-hour drive or train ride from New York City. While you could spend $800 per night at some of the area's pricey resorts, nearly all of the chain hotels are under $100 per night and some are as low as $60 per night. While you're in town, treat yourself to a meal at Mohonk Mountain House, priced between $42.50 and $72 per adult, and in addition to the meal made from fresh, locally-sourced ingredients from nearby farms, you receive access to the Mountain House, grounds, and hiking trails for the whole day. Pack a lunch or afternoon snack for your hike and save money on the additional meal. If you want your autumn fun in a big city, I highly recommend checking out Minneapolis. 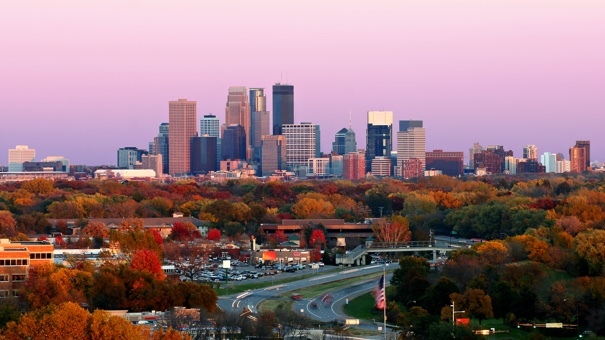 One of the most underrated cities in America, Minneapolis has a fall that rivals that of the quintessential northeast. This destination is especially good for outdoor sports enthusiasts. Use one of the many long and winding bike paths around the city. Or take your kayak out onto one of the 13 lakes. If you are a water adventurer, Minneapolis also has wetlands, the Mississippi River, creeks and waterfalls, and connected parkways in the Chain of Lakes and the Grand Rounds National Scenic Byway. You'll also find some of the best food, music, and art all at an insanely affordable price. I went to graduate school at the University of Virginia in Charlottesville. 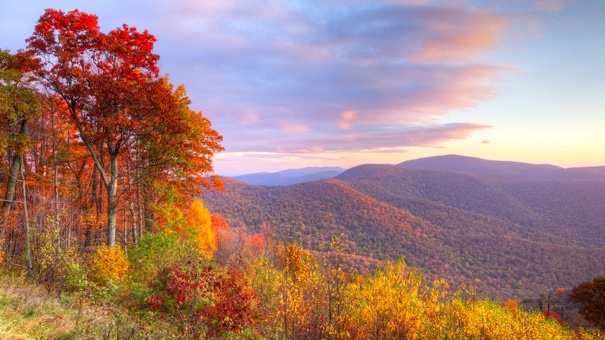 One of the main attractions was Shenandoah National Park. 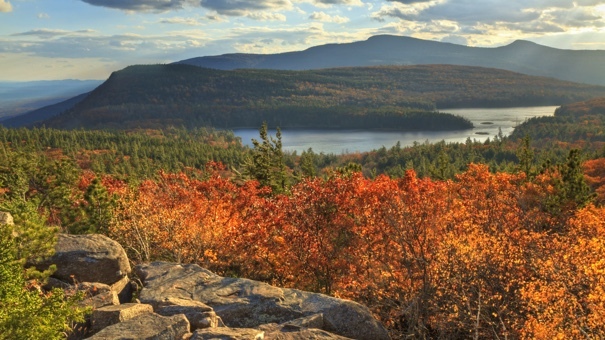 For people who love hiking and want a college town feel, this is the perfect combination. You feel like you're stepping back in time and getting away from it all, but it's only a scenic two-hour drive from Washington, D.C. and an hour drive from Richmond, Virginia. The area is also loaded with history that is best explored with a visit to Monticello (the home of Thomas Jefferson), Highland (the home of James Monroe), and the surrounding wineries. Like the Hudson Valley, there are resorts that cost a pretty penny but the chain hotels can be as low as $60 per night. You can also explore the local campgrounds and cabins to save some money on lodging. The Downtown Mall (a pedestrian mall that runs right through the heart of downtown) is loaded with affordable restaurants, bars, and shops. All of the wineries offer inexpensive tastings and flights. I highly recommend Delfosse Vineyards & Winery for their excellent food and a wine tasting that includes 10 wines for $10. Wisdom Oak Winery is another wonderful spot and a steal at $8 per person. Like Minneapolis, Seattle and Portland offer plenty of nature within a city setting. But if you really want to get out there to camp, hike, rock climb, mountain bike, and paddle your way through the vibrant foliage, I have to send you to the Columbia River Gorge. 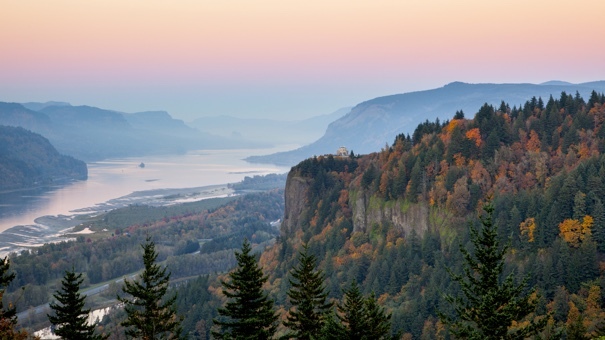 Lofty views, flowing waterfalls, and some of the friendliest communities you'll find, the Columbia River Gorge proudly wears the title of the largest designated National Scenic Area. Though it's beautiful year-round, fall is really the very best time to be there because the variety of colors all along the gorge provide the most colorful backdrop you can imagine. And like all of the destinations in this article, you won't have to empty your savings account to see it. Many of the hotels close to the gorge are under $150 per night. Some of the trailheads and recreation areas in the gorge require a day pass, but don't fret. The day pass only costs $5, a small price to pay for all that beauty.